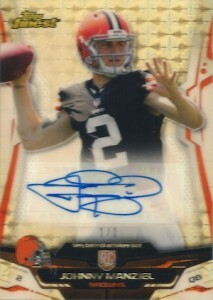 Topps Finest Football is known for a few things, including rookie autographs, colorful Refractors and Chromium technology. 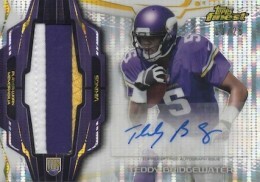 This formula has made it a fan favorite for many years and continues in 2014 Topps Finest Football. With two autographs in each box, collectors will find all the biggest names from the 2014 rookie class. Collectors can chase several different signed options for many of the top rookies, including autographed relic options. Understandably, names like Johnny Manziel, Blake Bortles, Teddy Bridgewater and Sammy Watkins dominate the hot list. Although rare, the various multi-signed cards offer some intriguing pairings that are heavy on rookies. Lastly, the power of the unknown always piques the curiosity of the hobby and the Mystery Rookie Autographs redemptions are seeing strong interest. One notable change is that the base rookie autographs are no longer on-card as was the case in previous years and now feature sticker autographs like the autographed relic cards. Check below for a real-time list of the 30 most-watched 2014 Topps Finest Football cards that are currently available for auction on eBay. The list is constantly updated with information, so check back or bookmark this page to view the newest card pulls and to keep tabs on pricing. 2014 Topps Finest Khalil Mack Rookie Card. Card #119 in the set. 2014 TOPPS FINEST FOOTBALL - BASE, REFRACTORS, X-FRACTORS - STARS, RC - U PICK!! 2014 Finest FB Complete Your Set!!! 2014 Topps Finest Factory Sealed Football Hobby Box Jimmy Garoppolo AUTO ? ?